Risk Management in Sport and Recreation is a comprehensive resource for those charged with the responsibility of providing for the safety of participants and spectators in a sport or recreation setting. It covers a range of safety issues, including lightning, heat illness, aquatics, playground safety, drug testing, and medical emergency action plans. Readers receive clear and detailed explanations of issues to consider before making decisions on risk management. A safety guidelines finder lists Web sites of accessible standards, guidelines, and recommendations from leading organizations. Chapter objectives and pullout boxes of key points and key statistics stress the importance of the topic under discussion. Threshold issues in each chapter highlight important factors to consider when making decisions on risk management. Real-world applications at the end of each chapter present scenarios involving the potential for harm, and readers must make a decision on how to address the issues. Examples of public service announcements, posters, and other publicly viewed safety information are presented. An appendix offers examples of emergency action plans, checklists, and recommendations from organizations such as the National Lightning Safety Institute and university aquatic centers. A companion Web site provides links to the Web sites used in the book, as well as updates to guidelines and links that may occur after the book is in print. Available at www.HumanKinetics.com/RiskManagementinSportandRecreation. The safety guidelines finder gives students and practitioners a single location from which they can easily access important safety information. Organized under land-based or water-based activities, each activity lists guidelines, recommendations, and standards along with the source for that information. Each entry includes Web sites where readers can find the full documents. The text also features sample guidelines and safety checklists from agencies and associations that demonstrate how organizations might plan for risk and communicate safety information. Readers also consider the types of postings and equipment they will need in order to communicate their risk management plans, and they are given real-life situations in which a risk management plan is needed and are prompted to consider why and how to create a plan for such situations. The resource will help students and professionals plan for and manage risk. 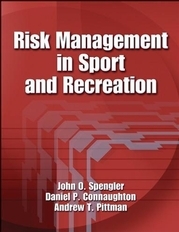 Current and future employees of sport facilities, school athletic programs, parks and recreation programs, youth and aquatic centers, or resorts and golf courses will find that Risk Management in Sport and Recreation provides the tools to assist in making the right decisions to manage risk effectively. Text for students in sport law, risk management, and recreation courses. Reference for sport and recreation administrators, managers, and libraries. John O. Spengler has both a law degree and a PhD in recreation administration. He has published more than 30 scholarly and practitioner-based journal articles and has written two other texts in the areas of sport, recreation, and law. He has also served as a safety consultant in recreation and sport. Dr. Spengler is a research fellow with the American Alliance for Health, Physical Education, Recreation and Dance (AAHPERD) and was named the University of Florida College of Health and Human Performance Teacher of the Year. He is currently an associate professor in the department of tourism, recreation and sport management. Daniel P. Connaughton, EdD, is an associate professor in the college of Health and Human Performance at the University of Florida. He holds four degrees in the fields of sport, recreation, and exercise science. An experienced participant, coach, administrator, and educator of many sports, recreation, and aquatic activities, he has more than 50 publications in scholarly and practitioner-based journals regarding legal, risk management, and safety issues of sport, recreation, and exercise science. Dr. Connaughton has served as a consultant on safety issues involving sports, recreation, physical education, aquatics, diving, and fitness and health club activities. He also holds several professional certifications, including emergency medical technician, American College of Sports Medicine health/fitness instructor, National Strength and Conditioning Association certified strength and conditioning specialist, certified park and recreation professional, American Sport Education Program certified coach, certified pool operator, and several American Red Cross aquatic certifications. Andrew T. Pittman, PhD, is the coordinator of the sport management program at Baylor University in Waco, Texas. He has coauthored a casebook on sport law and authored or coauthored six chapters in a sport law text. He has also written numerous journal articles on risk management and sport law and has presented more than 50 times at international, national, regional, and state conferences primarily in the area of risk management and sport law. Pittman has held numerous positions in the Sport and Recreation Law Association, among them president, treasurer, and newsletter editor. He is currently the Law Section editor for the Journal of Physical Education, Recreation & Dance and is a member of the Sport Management Council of the National Association for Sport and Physical Education. He has received several awards, including the Faculty Achievement Award from Baylor's School of Education in 2003.